Posted 6 years, 47 weeks ago. These are the notes I took during the talks at the One More Thing conference in 2012, including the slides which I’ve collected into one convenient place. Don’t limit PR to just the big guys. Email everyone. Be persistent and excited: why is your app special? Only show “rate me” pop up to people who use a lot (50th time). Don’t show when the app crashes (reset the counter). Turn off the rate alert remotely if there is a known bug causing crashes. Update less frequently to accumulate ratings. Use DCMA Guardian to help send takedown notices if your app is being pirated. “Power” or “Simplicity”, not both. The quality of your app is your marketing. If your app isn’t getting talked about, open Xcode and make it better. If your icon is clickable on Facebook, then it’ll be tappable on the App Store. Releasing solid frequent updates sells more apps. Building a lot of low ranking apps does not compare to having one high-ranking app. Charging less has never helped to sell more. Review sites love niche games. Get a forum account on GameArcade and talk about your game. Don’t do updates. Do another game instead. Don’t release a game right before Christmas, publishers rule the charts at this time. Identify failures, correct as you go. If you encounter a problem you can’t handle, unplug (Ludum Dare). Trademark your name and icon. Submit while testing & localising “What’s New”. Check the “Hold for Developer Release” checkbox. Don’t cheat to use private API methods, this can get your license revoked. Don’t enable behaviour after Apple’s review. Don’t change behaviour based on Apples IPv4 range. Discoverability is tied to keywords, name, icon, description, screenshots. Get featured: study featured apps and follow their example. Adopt new iOS features, even if it doesn’t make a lot of sense. This helps you get featured. Advertise to Apple employees (this apparently didn’t work). The best way to motivate a designer is to do your own design. Copy copiously (not in the bad way, though). There still aren’t a ton of great apps out there. Don’t stop (and don’t slow down). Design is like chess: you kill a lot of pawns before you get to the king. It’s all the small things that matter. 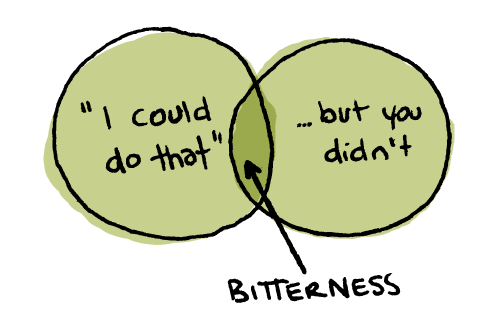 A venn diagram representing where bitterness can occur. Ideate with everybody. Execute with a great team. Release with booze. Build something to learn your tools. When others are being featured or reviewed, just keep improving your app. Luck - none of the factors for getting reviewed are actually random. Be prepared to capitalise on your big moment. Do your research on the App Store. Include easter eggs in your app (this will help with people talking about the app). The amount of effort it takes to develop and easter egg compared to the amount of effect it could have is huge. Determine your personal goals and write them somewhere you can see. Work towards your goal every day. Work on projects you enjoy, projects that excite you. Do what you love (even if it means “selling out”). The brand you’ve built around your app or your company is on of your most important assets. Advertising apps doesn’t work (everyone seems to agree on this). The best advertising you can do is to try to be featured by Apple.